Connect with your Subscribers in LeadLinks, and create product "interest" Tags. If you're a LeadPages user and want to have the LeadLinks feature pushed to ConvertKit, it's very doable. You just need to swap some of the default Form variables with ConvertKit's! 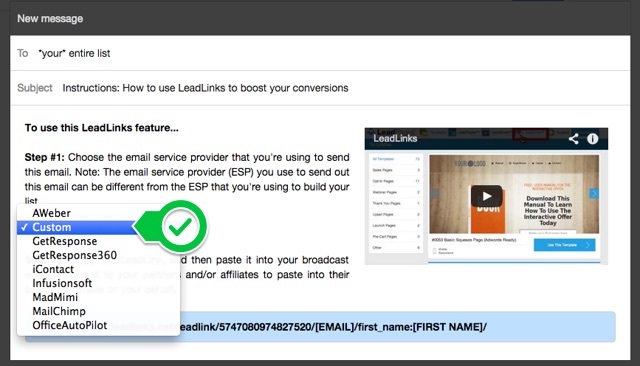 In your LeadLinks options, make sure you have "Custom" selected from the dropdown menu. After you've selected "Custom", the link below will be editable. Here's where ConvertKit comes in. You'll want to note that your link's number string will be different than the example above. Don't worry about changing this. You can share this link anywhere, to gather new Subscribers. All the reader will need to do is click! You can also paste the link into a Broadcast email. For backup, check the Lead Notifications option on integrations, which will notify you when there's a new subscriber. One other thing: did you know ConvertKit has a similar, easier function? With ConvertKit, that magic is coded in. You have a webinar approaching, and you want people to register. Instead of asking your Subscribers to enter their email again, on a Form, create a Link Trigger in Automations! Then do the same thing when you send the live webinar link, creating a Tag for "attended" and remove "registered". You are going through a product launch, and sending emails to your list. Create a Trigger for the sales link, so you know who has expressed interest, but hasn't yet purchased. Later, you can send an email specifically to this group, (or Segment), while excluding the buyers! You can do this with Link Triggers. All with one click!